Zoulah is so proud to bring you her latest creation in her Bewitchen Kitchen. The Red Couch Food Critics loved Zoulah's Egg Rolls and clamored for more. 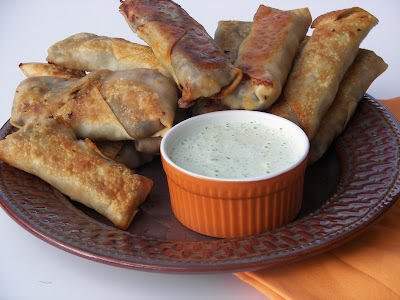 They happily dipped their mummies (egg rolls) in the addictive moldy dressing (Cilantro Ranch Dressing). The Cilantro Ranch Dressing is not her creation but Zoulah adores it as well. She could use the Cilantro Ranch Dressing as toothpaste -- hmmm looks like maybe she did! She could use the Cilantro Ranch Dressing as a face mask --- hmmm looks like maybe she did -- is that why her face is green? 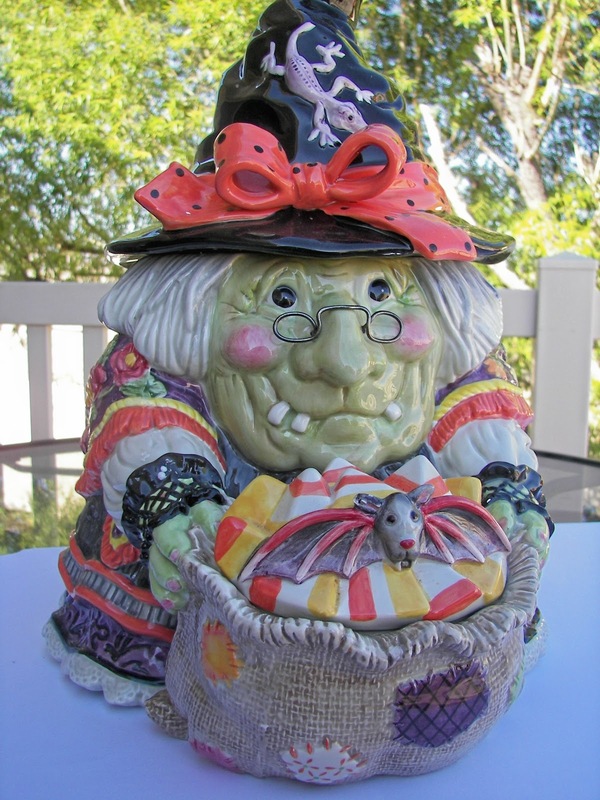 She dipped her warty, gnarled fingers in the dip cackling with delight! She thought the dressing would be good for hand moisturizer . She is so thankful to Our Family Favorites for recreating this dressing from one of her favorite restaurants, Cafe Rio, Cafe Rio is a Utah institution. They are famous for their Sweet Pork Barbacoa Salads served with this Cilantro Ranch Dressing. Zoulah included a "leeeetle" tutorial on making egg rolls and reminds everyone that they are simple to do. In a large bowl, combine everything but the egg roll wrappers. Mix well to blend. 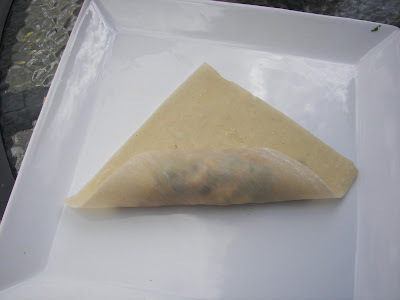 See the tutorial for making egg rolls below. Preheat the oven to 425˚ F. Lightly oil a baking sheet with cooking spray. 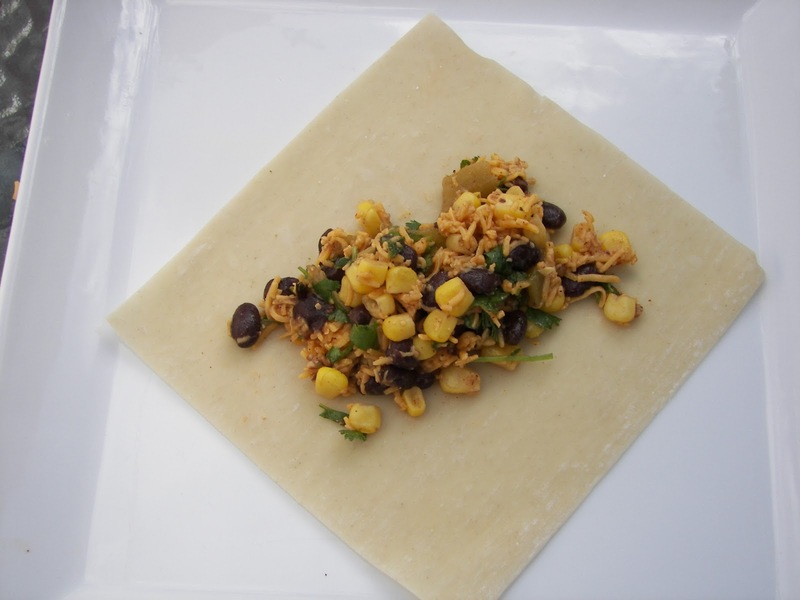 Place the sealed egg rolls on the baking sheet seam side down and drizzle the tops with olive oil. Bake for about 15 minutes, or until lightly brown, turning halfway through baking. 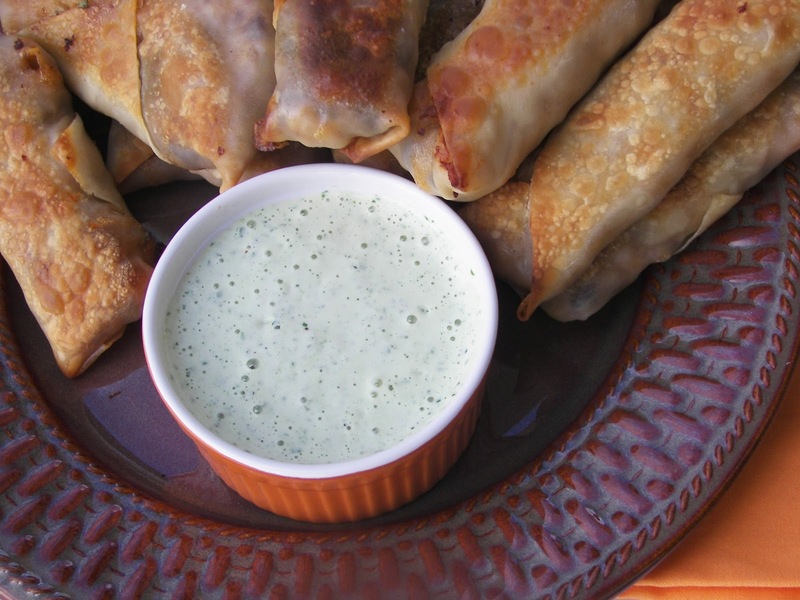 Serve warm with Cilantro Ranch Dressing. Place about 2-3 tablespoons of the filling on top of the egg roll wrapper. Have the egg rolls cornters pointing towards you. It will be a diamond-shape. 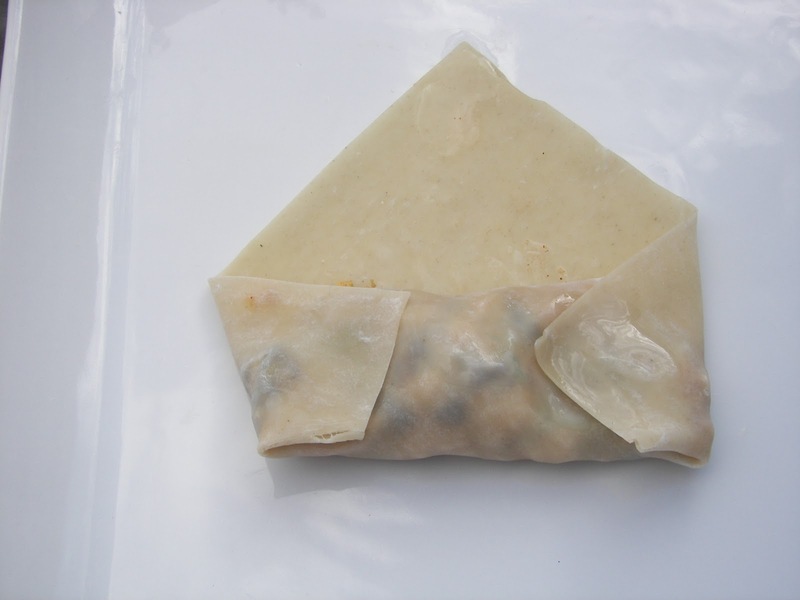 Tuck the nearest eggroll corner near you underneath the filling and make it tight. 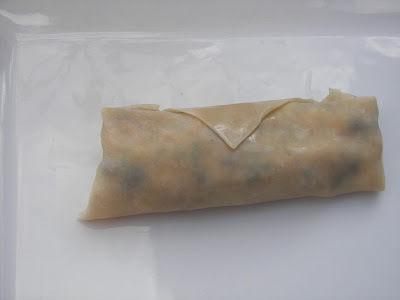 Put a little bit of water on the egg roll and fold the left corner in. Put a little bit of water on the egg roll and then fold the right corner in. Roll the eggroll and then seal the corner with water. Bake the egg roll with this top down on the pan. The Cilantro Ranch Dressing is irresistible! 1/2 bunch of fresh cilantro -- washed, but you don't need to take the stems off. ﻿Zoulah hopes you enjoy these Egg Rolls! Oh yes! Baked egg rolls. I love them, but I always feel guilty eating and enjoying them. I could eat a boatload of these. Hi Zoulah! 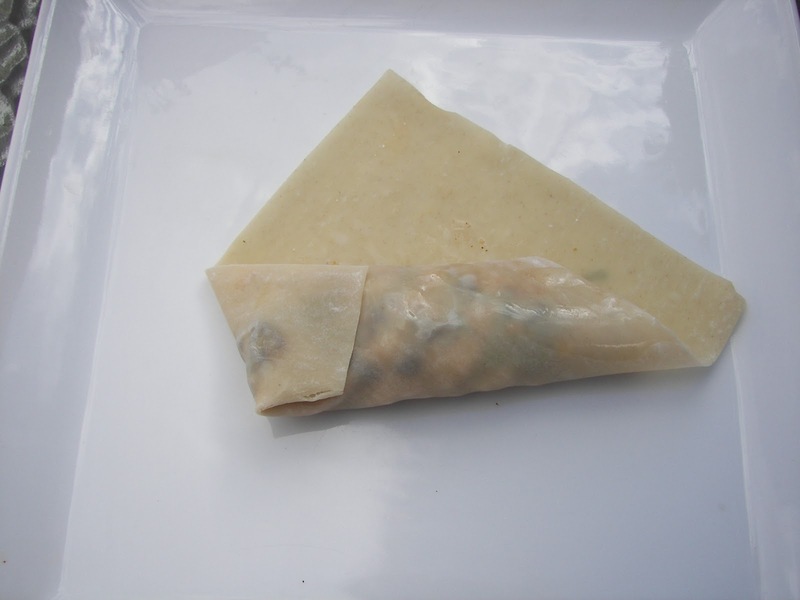 Your egg rolls look delicious as does the moldy dressing. If these are half as good as Joni's pork egg rolls, I'm on board. Tell zoulah we have been drinking this stuff lately too! I made it for pizza sauce this week when we lit up the pizza oven, and then dipped my bread sticks in it! I could paint my face in it too but I am worried I might end up with Zoulah's skin color! Now all we need are the mummies! Sounds like a good dinner this week! Yummy mummy! Zoulah has great taste in food and color! I can't wait to try those southwestern egg rolls and dipping sauce. Toothpaste? Who are you kidding, Z and B have never let toothpaste touch their witch lips. or teeth! Looks great, have to try the bake method, I have only fried. Come over for a Nordic Cornucopia pan give away! I am printing this out! Thanks for helping me with my dinner plans tonight. I think with a salad this would be perfect!